If you ever played the multiplayer game, then, you already know about “discord”. Even, nowadays, mobile users also started using discord App to communicate. 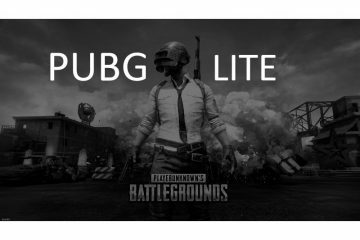 Because in-game voice feature doesn’t work properly, in PUBG Mobile Game. And, many mobile and computer users are facing “Discord mic not working” problem. Means, other people not able to hear the voice. Though, discord PC and mobile app show the green signal when the user speaks. But, still, other people can’t hear. Because, due to some problem, discord not transmitting voice. I was also facing the same problem with discord web App and mobile App. But, after checking many settings, I found some solutions. 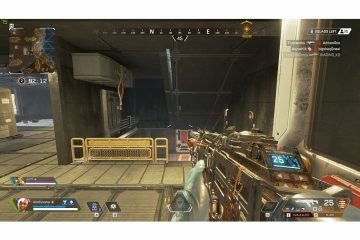 There isn’t any specific reason behind “discord not picking up mic” problem. So, in this article, I am going to mention certain solutions. You need to try out each solution. Until your problem gets resolved. 1 Fix Discord mic not working. 1.1 Solution: 1. Check your headphone or earphone mic. 1.2 Solution: 2. Perform an Upload Speedtest. 1.3 Solution: 3. Logout and restart discord. 1.4 Solution: 4. Run Discord as Administrator. 1.5 Solution: 5 Reset the Voice Settings. 1.6 Solution: 6 Check Voice Settings. 1.7 6.1 Select Right Input Device. 1.8 6.2 Enable input mode and sensitivity. Fix Discord mic not working. Solution: 1. Check your headphone or earphone mic. Before start making some changes in discord App. 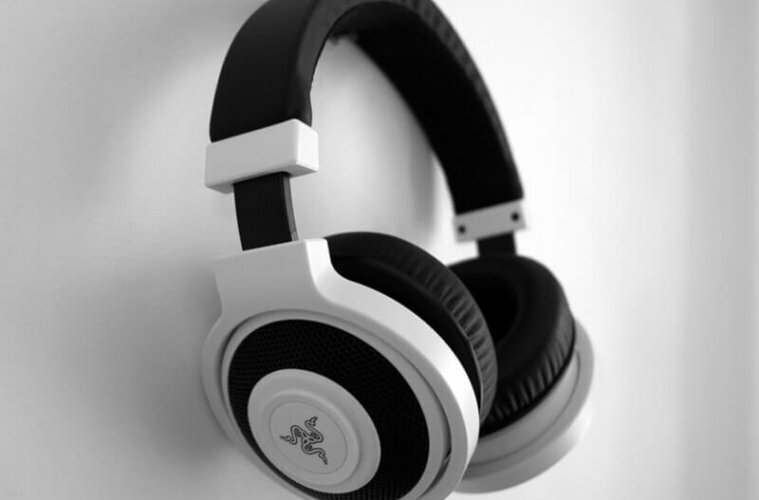 You need to find out that your headphone mic or earphone mic is working or not. If you’re using an external microphone, then it could be the cable issue. 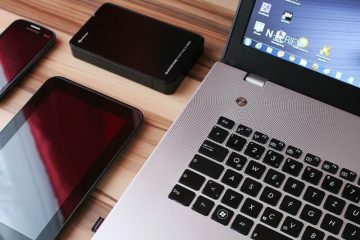 To test headphone mic, simply connect it to your Mobile or Computer. Now, all you need to do is record your voice. And, then listen. If there isn’t any background noise coming. Means, your mic is working perfectly fine. But, if you’re able to listen to some background noise. Then, that could be the reason behind, “discord mic not working”. So, I suggest you change the microphone or headphone you’re using. If the mic isn’t able to record anything. Then it could be possible that 3.5mm audio jack is not working. So, use another device to find out. Solution: 2. Perform an Upload Speedtest. To use discord App, you need a good internet connection. Mine discord mic wasn’t working with the data connection. 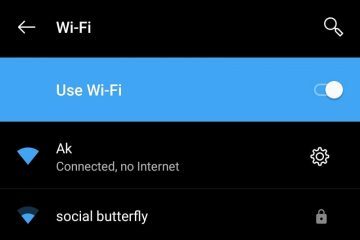 But, after switching it to the WiFi connection, it started working. Good internet means not with the good download speed. With the upload speed. Because to transmit the voice you need uploading speed. How to check internet connection speed?. 2. Open App, and you”ll able to see the “GO” button. But, before starting the speed test. 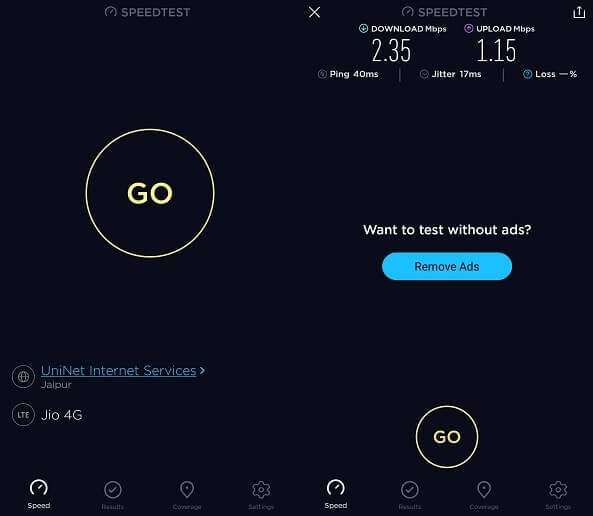 I suggest you choose the fastest and nearest server for SpeedTest. Now, you can tap on the “GO” button, to check upload and download speed. The App first does check for the download speed, then does check for the upload speed. So, wait. If your upload speed is below 0.1 Mbps. Then, discord can’t able to transmit voice properly. In my case, the upload speed is 1.15 Mbps. That’s why discord able to transmit voice. And, if your upload speed is very low, showing between 0.1 – 0.3 Mbps. Then, change internet connection. Or, if you’re using the data connection, then, try moving around. And, find out, right place where the internet works properly. Solution: 3. Logout and restart discord. If discord was working perfectly before the same internet and mic. And, suddenly, your friends not able to hear your voice. Then, it could be a glitch. So, to fix discord quickly, you need to log out and restart it. In Computer – Go to user settings. Now, at the bottom left corner, you will able to see log out option. After logging out, simply close discord App from Windows. And, then start it after 30 seconds. Now, log in using your account details. And, hopefully, this time mic will able to transmit your voice. Solution: 4. Run Discord as Administrator. Since discord uses the UDP protocol to transmit voice. And, if discord doesn’t have admin privileges to send packets. Then, the problem like “discord mic not working” occurs. This solution was recommended by customer support of discord. Close, discord App completely from the Computer. Now, right click on discord app shortcut and then choose “Run as Administrator” option. Alternative Method – If you don’t want to go through this option every time. Then right-click on discord App shortcut, go to properties. Click on the compatibility tab. And, then mark “run this program as an administrator” option. After that, click on Apply, then click on OK. Solution: 5 Reset the Voice Settings. Discord comes with many settings to optimize voice chat experience. And, if you have made some changes to transmit and hear the clear voice. But, ended up facing “discord mic not working” problem. Then, you can fix it by resetting voice settings. It will set voice settings to default. Although, I am not able to find out this option in the Android App. So, this solution works only for Computer users. Go to user settings > voice and Video. Now, Scroll down a little. At the end of “voice and video” settings option. 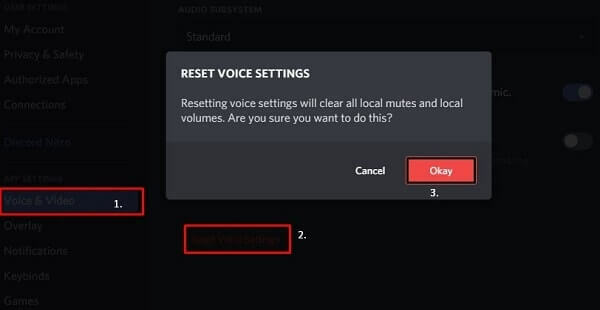 You”ll able to find out “Reset voice Settings” option, click on it. And, if you had mute someone, then it will unmute. So keep that in mind. You”ll get a warning, click on “Okay”. Solution: 6 Check Voice Settings. If you’re new with discord. Then, you might don’t know, about its settings. And, if all the above solutions don’t work. Then, you need to make certain changes. To make changes you need to go to the user settings > Voice & Video. 6.1 Select Right Input Device. If it’s on default, then it could be the reason behind “discord not picking up mic”. So, in the first setting, you will able to see the input and output device. And, Problem is with, transmitting the voice. You need to select your mic in the input device. As you can see, I have select “Headset Mic”. Because I am using “Mi basic Earphones”. Now, check that, mic started working in discord or not. If not, then try next setting. IMPORTANT – If discord not recognizing mic. Means, your mic isn’t showing in the input device. Then, it could be the driver issue or headphone jack issue. 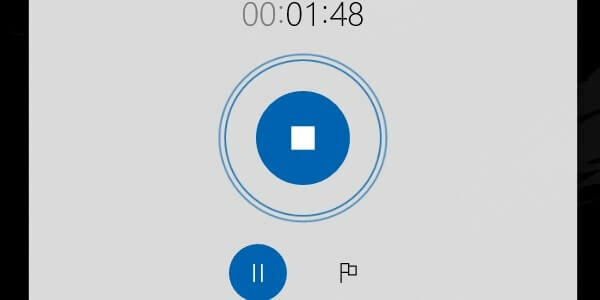 To fix this problem quickly, right click on the speaker icon. Click on “Open sound settings”. Here you can select your default input-output device. And, if the mic isn’t showing, then use troubleshoot option. Also, go to the device manager and install the latest audio driver. You can find out certain guides on the internet. 6.2 Enable input mode and sensitivity. If you’re using “voice activity” feature. Then, make sure “automatically determine input sensitivity” option is enabled. After enabling this option, discord will start transmitting your voice. Even, when you speak in the low voice. In the push to talk feature, discord not able to listen to voice automatically. You need to press a button to speak. So, while playing games, “voice activity” is the best option to choose. 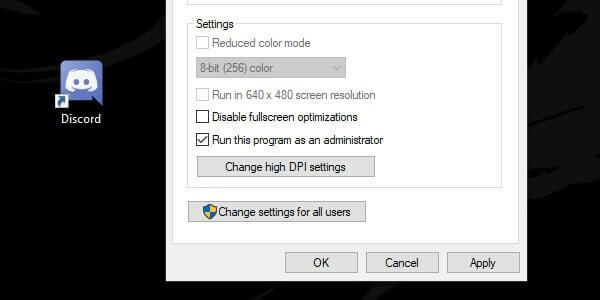 After setting up these main settings. Now, check in the voice processing three options are enabled or not. I am talking about echo cancellation, noise suppression, and automatic gain control. These options will reduce background noise so that the other person can hear you. You can disable “enable quality of service high packet priority” option. But if you enable it. 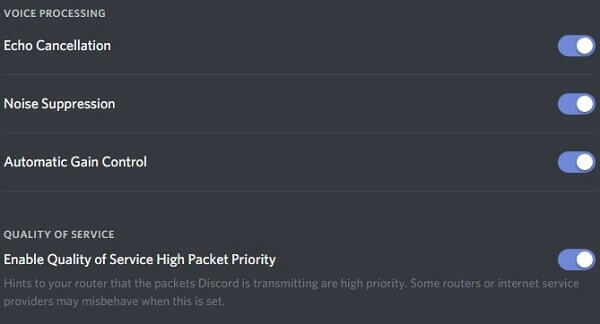 Your internet connection will give “discord voice transmission” high priority. So better keep it enabled. Do you have a discord server? Then, try out “Best Discord Bots“. That’s it. Other settings aren’t the cause behind “Discord mic not working” problem. So, you don’t need to make changes. Previous ArticleFix Printer Offline Error in Windows – Bring Printer Online. Next ArticleFPS Counter Software – To check Games Frame Rate Per Second.